Lee McAllister is brimming with confidence ahead of his Commonwealth lightweight title defence against Ghanaian Samuel Amoako on Friday night. The 27-year-old has insisted to the fans that they will be in for a treat at Glasgow's Bellahouston Leisure Centre. McAllister has been in 28 fights in his career, winning 26 and losing only two. 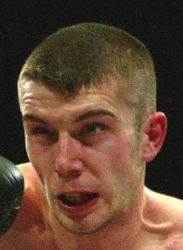 The Scottish boxer is in high spirits and has promised to show off his skills in the ring. He said: "The Sky viewers are in for a big treat when they watch the Aberdeen Assassin. "They are going to see the best technical boxer and the best fighter in Scotland. "It is massive exposure for myself and I am looking forward to performing for the viewing public and all the fans who turn up on the night. "But the fight is more valuable for the public because they get to see me. "I'm sure I am going to entertain the crowd and they will see a quality fighter." The two fighters were at what was a relaxed weigh-in ahead of the big fight and McAllister is ready to get down to business. He added: "Having seen him, my view hasn't changed. I won't worry about him until the first bell. "I haven't seen videos of him but I don't look at videos of fighters, I always let them do the worrying. I will take it as it comes. "If he thinks he is going to beat me then I would just like to say to him - come ahead, let's get it on."